For over a century, French children had a mid-week break from school: in state schools, On Wednesdays, they had half or a whole day off so those who wanted to attend religious instruction with the Catholic Church . To make up for, it, there was school on Saturday mornings. 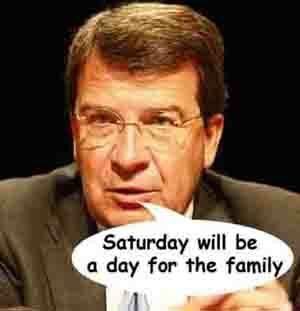 In 2008 the Minister suddenly announced: "Saturday will be a day for families" and banned Saturday classes in primary schools. He cut lesson time from 26 hours a week to 24, which is still longer than in Britain. Many French school organise this as a FOUR DAY WEEK, with a complete break on Wednesday; others still have Wednesday morning school. In a poll, 80% of french parents welcomed this change - for some, it made it easier to away at weekends (richer families could go skiing!). Teachers said that some children would fall behind in their work, especially those from poorer families that couldn't afford to pay for extra classes and activities for their children. In 2008, researchers had told the French Minister of Education that younger French pupils were often too tired to learn properly. Traditionally, French primary schools had the longest school hours in Europe - often 8.30 iam until 4.30 pm. Most had no school (or only a half day) on Wednesdays, with classes on Saturday mornings. In 2011, the French government started looking again at the primary school calendar - this time looking at giving children a shorter working day. - so they weren't so tired. They said Wednesday morning lessons would be reintroduced in all schools, increasing the school week to 4 and a half days. To make up for shorter days, the long summer holiday will be 2 weeks shorter. There may also be homework clubs at school, to reduce the need to do school work at home. The government is also experimenting with trials of more sports and arts activities in some schools, awhich may lead to more changes in the school working week in the future. Children may even end up spending more time at school, but not all of it doing lessons!